This recipe is so simple and easy to make, but full of amazing benefits. Chia seeds are PACKED with goodness. They are an excellent source of omega 3 fatty acids, rich in antioxidants, and they provide fiber, iron and calcium --- do your bagels do that ? Thrown together in just a couple of minutes! I usually make this the night before and it should last a few days. 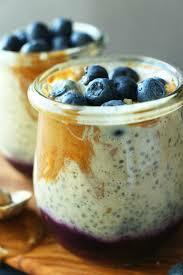 The thickness of the chia pudding will vary based on the kind of milk you use - I use almond or coconut milk. Remember if it’s too thick, you can add more water or if it’s too thin you can add more chia seeds and let it sit for 30 minutes or so. Whisk the almond milk, chia seeds and sweetener together in a large bowl. Let it sit for 10 minutes and whisk again. Cover and chill in the fridge for 3 hours or overnight.